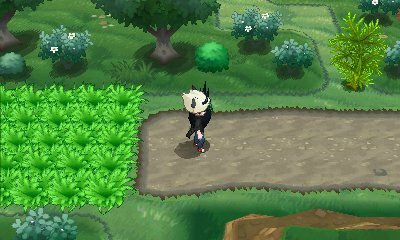 Like the previous generation, Pokémon X & Y gives a few new ways for you to encounter Pokémon other than the standard walking around in grass, caves, flowers and surfing/fishing. The most notable change is the Horde encounter. Hordes have their own encounter table and feature a variety of Pokémon in each route which cannot normally be found. They can be found in the grass at random, or triggered through the use of the move Sweet Scent or the item Honey. 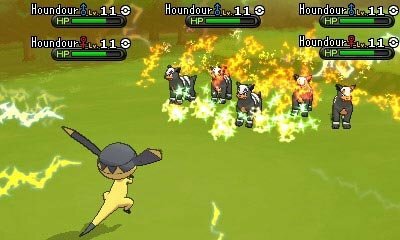 Hordes are good for EV training as well, so it's always best to try them out. Another addition is a variation on the shaking grass/dustclouds from Pokémon Black & White. This time, there will be various shaking areas in routes and caves. In routes, you will find the odd shaking bush which, when you get near, will have the Pokémon leap out/down and attack you. In caves, there will be shadows on the ground, with bits of dust falling. When you step under it, a Pokémon will swoop down and attack.